Long answer: it’s Christmas buying season, and Nikon is out there with a ton of FX camera bodies, including the very low-priced D610, trying to get you to step up from DX or crosswise from another vendor. 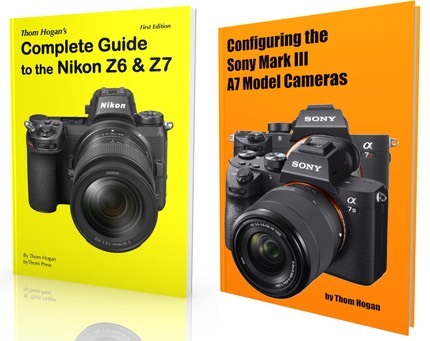 Sony doesn’t want you to buy one of those, they want you to wait to see how good the A7II is instead, or maybe even wait for their intentionally leaked A9 to appear. They want you to fear (F) that you might make a bad choice in buying a camera now, be uncertain (U) that you’re making the right choice, and doubt (D) your decision making. 30% faster autofocus! 1.5x tracking autofocus! Everything stabilized! Who wouldn’t want those things? Of course, the A7II won’t show up in the US until the end of January or early February, which is right when the next round of significant new product announcements will be commencing from their competitors (and yes, Sony too). Sony better get the US/European pre-orders for the A7II locked in soon ;~). Personally, I hate the FUD game. To me, it implies weakness, not strength. One has to wonder what this early announcement does to Sony’s A7 sales during this critical buying season. Right now that camera is sitting at US$1500 for the body, or US$100 less than the camera they don’t want you to buy (D610). But announcing the A7II at a Japanese price that equates to US$1500 US means that if you buy an A7 today, you’re giving up all those great new things Sony is trumpeting in the A7II just to have a camera for Christmas. I suspect that Sony just stepped on their US/Europe A7 dealer sales this holiday and will have to lower the price of that body further to get rid of remaining stock at dealers. Sony is currently saying that they didn’t announce the A7II in the US and Europe because they didn’t have time to prepare dealers. I’d guess that the real reasons they didn’t announce the A7II in the US and Europe is because (1) they don’t have any real inventory yet because they just started building it; (2) the dealers in the US would have screamed bloody murder (“what do you mean that you have a new camera I can’t sell for Christmas?”); (3) the sluggish sales of mirrorless in the US; and (4) FUD. But there’s an even more interesting friction in the A7II pre-announcement: Sony has three A7 cameras. They all need the features introduced in the A7 Mark II. I’m a little less likely to buy an A7s or A7r today because I now expect Mark II versions of those cameras with the same new features. That’s the problem with compelling features: once introduced, anything you’re selling that doesn’t have them suddenly doesn’t look so hot. You in essence discount your current products when introducing a future product as Sony just did. The marketing wars are heating up. But it’s a whole ‘nother thing to set yourself on fire. Unfortunately, the net impact of a pre-announcement like the A7II is that Sony will likely increase their SG&A expenses on their previous cameras, making it harder to make the numbers stay on the profitable side of the ledger. My take is that the camera makers still haven’t mastered selling what they have. They are addicted to iteration being their savior, and have recently gotten hooked on pre-ordering. But in a declining market, any friction that slows current product sales really should be avoided whenever possible. Selling an A7II in Japan only for one month is not really going to help Sony make their financial projections. So why do it? They could have marketed the A7 heavily for Christmas, then announced the A7II in January at CES. I was one of the principals at the company that is most often cited for pre announcement of a product leading to failure (Google “Osborne Effect”; but be aware that even The Osborne Myth section on Wikipedia is not totally accurate; I’m surprised that no one has edited that to pick up my quotes and comments on what really happened). The Osborne Effect is indeed a friction. A significant friction. It won’t kill a company on its own, though. It just makes you less efficient in sales. Wait, aren’t sales the one thing that camera companies need most at the moment? I’ve said it before and I’ll say it again: the Japanese camera companies are weak at marketing, especially on a global scope. They really don’t know how to sell their current product efficiently, and this is a time period where they absolutely need to do better at that. That Sony is announcing a product that most of you can’t get at a time of year when most people are in a buying mood is counter productive at best. I suspect that Sony, like the other Japanese camera companies, just doesn’t understand the Internet. They think that they can do a one-market announcement (Japan) and both tailor and keep the news confined in that market. Sorry, but it doesn’t work that way. Within minutes I found dozens of “I wonder if this will ever appear in the US” kinds of posts on the Internet (the tailoring problem), and within hours I found hundreds of Web sites reporting the launch of the camera (including this one). By not saying at the Japan announcement that the product would be available later in all markets, Sony added yet another friction to the friction they were creating. In essence, they FUDed themselves! Couple all this with the ubiquitous leaking coming out of Sony on future products, and all they’re doing is making their eventual marketing jobs harder. Creating buzz that’s not for the product you’re actually selling is another of those counter productive things. Suggestion to Sony: tighten the ship against leaks and get better at selling what you have. And before people jump on me about this article, yes, I have called Nikon to task on the same thing (it happened first with the D70 back in December 2003). And no, I’m not trying to say that the A7II isn’t a good product. Okay, it seems I was wrong. I’m still not sure this was the right way to announce the A7II, though. The A7II now will be available in the US and other markets on December 9th, and the original A7 has received a US$400 discount, putting it at a very aggressive US$1299 price for the body only. So it seems that my original FUD comments were wrong, Sony is clearly trying to be aggressive in moving A7 bodies (both old and new). The new price, by the way, is below the original dealer price for the camera, which means that Sony has had to price protect dealers to sell at this price. That type of cost tends to show up in SG&A lines on financial statements so that the product itself still looks profitable, and gross profit margins on products look intact. Still, Sony is FUDing themselves with the A7II: given the sudden price drop on the A7 and the appearance of the A7II at the old price point, why would you want to buy an A7s or A7r right now? You have to believe that Sony will pull the same game on those models in coming months. Moreover, Sony is being more aggressive than most camera makers in cycling products. The A7 barely makes it more than a year before it gets the usual ~25% end of life price drop. That kind of thing used to be done only in consumer DSLRs and compact cameras, and that too rapid iteration in a declining market is what flooded the shelves with multiple generations of products simultaneously. It’s looking like the rapid iteration of the RX100 and the old NEX models is now sneaking across Sony’s entire lineup, to where one year life spans for cameras are becoming more and more the norm at every level. This, too, will tend to make people hesitate once they realize that, because Mark II and Mark III and Mark IV are all coming. Soon. Personally, I’m not going to update to an A7II any time soon. While I like the changes Sony made to the new version, I haven’t gotten my money’s worth out of the old version yet. Moreover, one of the things I really want doesn’t seem to be in the new camera (uncompressed raw; though it was mentioned by someone in Japan, the brochures and literature all have the same ARW 2.3 format information, and thus still claim 16-bit raw when the camera actually doesn’t produce that). That said, at the new price the A7 is a full frame bargain, one of the better deals so far this holiday season. It’s a highly competent and pleasing camera, and its few drawbacks weren’t deal killers at the old price, so a 24% price drop makes it quite interesting for someone contemplating full frame. It’s possible that Sony will push out the remaining A7 models fast at this price. Still, I get the feeling of lots of last minute decisions being made here. Sony USA seemed to be scrambling to keep up. This wasn’t the most efficient announcement Sony has made, by a long shot. It appears to me that the camera makers are just scrambling to keep high profiles as sales continue to slide. As I’ve noted before, Sony is sort of on a “release a month” type of schedule these days, trying to keep their PR and marketing engines constantly active and producing buzz. Not a terrible thing to do, but I have to wonder what the eventual costs of this are going to be. By pushing the price down so aggressively so fast on full frame A7’s, Sony now has the E-mount and RX lines bottled up in price right under that. It appears that Sony, like Nikon, really wants to upsell you now. Take advantage of that while it lasts, because with declining volume you can’t dive to the bottom on prices for very long before you just run out of airspace and hit the ground.